Are TBIs contributing to our homelessness epidemic? Are traumatic brain injuries contributing to our homelessness epidemic? King County’s homeless population is one of the largest in America, and Washington State is struggling with a homelessness epidemic. An estimated 27,000 children of school-going age were homeless during the 2011-2012 school year, and that number rose to over 30,000 in 2014. A decade-long plan to end homelessness in Washington State ended in failure, with homelessness rates going up, not down, during King County's 10-Year Plan To End Homelessness. The Substance Abuse and Mental Health Services Administration estimates that 20 to 25% of the homeless population suffers from mental illness, compared to only 6% of the American population as a whole. Studies have shown that 45% of homeless men surveyed have experienced traumatic brain injuries, which can have profound effects on mood and cognition for years after the initial injury. Traumatic brain injuries happen when the brain is penetrated or jostled around inside the skull, striking the hard bone surface. Direct blows to the head can cause traumatic brain injuries, but often the cause is more subtle. Brain injuries can occur after an explosive blast, a blow to the chin, or even an accident in which the head is suddenly whipped around on the neck. Drug or alcohol blackout or oxygen deprivation can also result in damage to the delicate neurons of the brain. Brain injuries may come with immediate side effects such as nausea, confusion, and balance and vision problems—but they can also cause issues with cognition, memory, and personality that last for years after the initial traumatic event. People suffering from the long-term effects of traumatic brain injuries may have trouble controlling their emotional responses and remembering important information. Those symptoms can make it difficult to hold down a job or maintain a support network, and the loss of that financial and familial stability can result in an abrupt tumble down the economic ladder. In areas like King County, where income inequality and high housing prices are already squeezing homeowners and renters, lost income has a higher chance of resulting in a lost home. Researchers say that most of the traumatic brain injuries suffered by homeless men happened before they became homeless. That means there’s a strong possibility that these traumatic brain injuries could be a significant risk factor for homelessness. While health care providers who work with the homeless population may already be aware of the signs of untreated mental illness, they may miss the symptoms of traumatic brain injuries, which can exacerbate other mental health issues, substance abuse, and seizures, among other problems. Ciara Mahan, a psychologist who works with the homeless in California, told reporters, "It helps explain why some homeless can't form new memories or do something like make the correct bus fare. Some of these people are really smart, but they have poor decision-making abilities or a basic inability to understand what's being said. So many homeless also are angry and argumentative, but we're seeing a medical reason why they act that way." 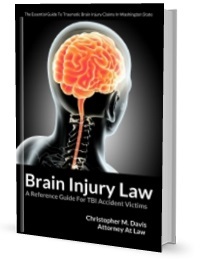 If you or a loved one has suffered a traumatic brain injury due to someone else's negligence and are unsure about your legal rights, contact Davis Law Group at (206) 727-4000 or use the confidential contact form on this page to have your case personally reviewed by our award-winning attorneys. If we believe we can help, we'll schedule you for a free consultation to explain more about how pursuing a personal injury claim might be in your best interests. I am grateful to see this published and particularly the comment by Dave Jewett because I suffer from both and it is difficult to navigate the medical and legal issues regarding TBI. The issues discussed here are just the tip of the iceberg. Many soft tissue injuries - whiplash, as an example - cause long term inflammation in the spine, brain stem, neck, etc. This may cause severe emotional/intellectual changes to the victim, resulting in an inability to return to their previous work. Further, soft tissue injuries are difficult to obtain settlements based on true losses. The legal system plays a substantial role in these losses, as corruption throughout the legal system (appears to) make it impossible to collect a settlement based on the true loss.